I don’t know about you, but I am gearing up for a super lazy weekend, where the food cooked is simple, quick and lulls you back into lazydom 🙂 Potatoes thus are an important part of this meal. 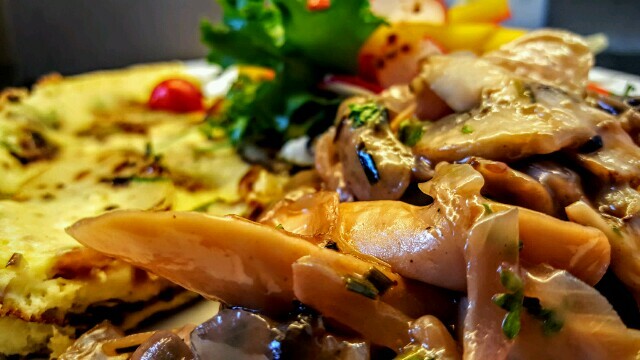 Throw in some eggs for the proteins and a quick salad for the fibre, a glass of wine stirred into some wholesome mushroom and sausages and I am set. Does that seem like too much work? 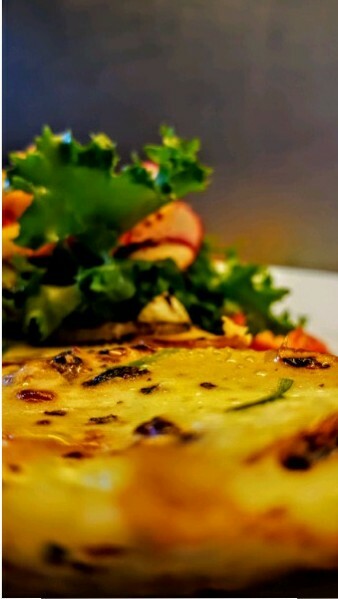 Tortilla de Patatas is the Spanish name for Spanish Omelet, yup it does deflate the dish a bit when you call it by that name doesn’t it? So we’ll stick to Tortilla de Patatas. 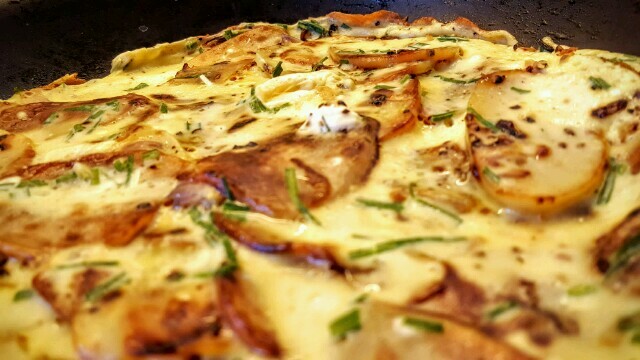 As the name suggests the main ingredients are potato and egg. I have deviated from the original authentic recipe and added green onions (scallions you can use chives too), cream cheese and green garlic. Green garlic is a seasonal vegetable and I try to use it in as many entrees as possible. I find it gives the dish a much rounded, sweeter and subtler aroma. To make it a complete meal, I added on a meat dish and a salad. So this post has all 3 recipes. Helps put together the meal without moving from one post to another. Equipment Needed: 2 skillets and Egg beater. 1. 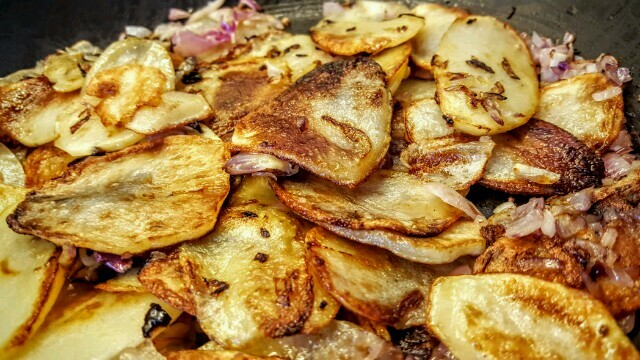 In a skillet, add half the olive oil and fry and onions and potatoes till the potatoes are cooked and have gained some colour but are not over cooked. Make sure every slice of potato lies flat on the skillet. You want them to cook evenly. 2. Remove and set aside. Fry and second lot of potatoes if you haven’t managed to put them all in, in the first round. 3. 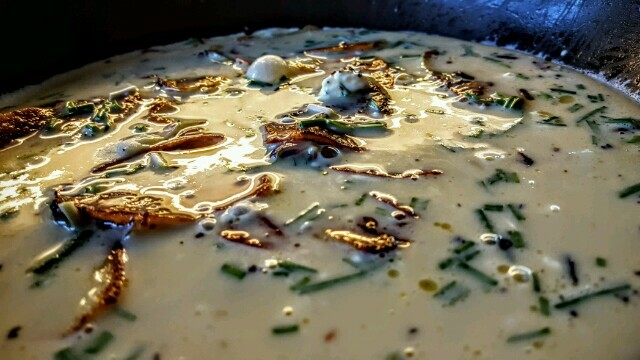 In another bowl, break the eggs and beat them, add the cream cheese, parsley, salt and pepper. Mix it well. 5. Pour the egg mix over the potatoes. Drizzle the left over oil over the edges of the pan, which will give the eggs enough fat to cook in. 6. Cover and cook. (At this stage you can start working on your sausages). 7. 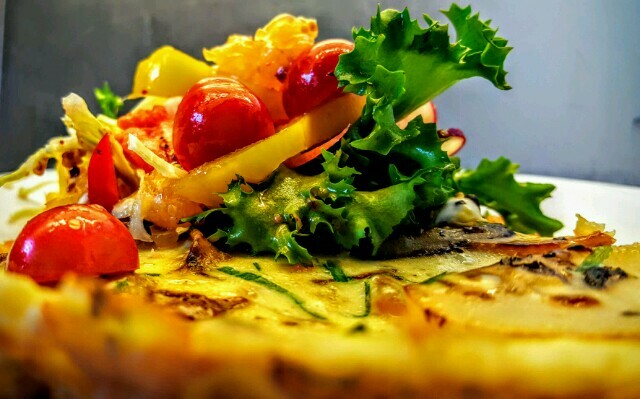 Once you see the edges of the eggs brown, lift the edge slightly and tilt the pan towards the lifted edge, such that the uncooked eggs run into the space between the cooked omelette and pan and start to cook. This will also give your dish a fluffed up texture. 8. Cook covered till the eggs are done. The entire process takes about 10 minutes. 9. Traditionally the Tortilla de Patatas is served cold, but I detest cold food, so I’ve served it straight of the pan. 1. In a skillet, heat the olive oil and fry off the green garlic. Add the onions and cook till they are caramelized. 2. 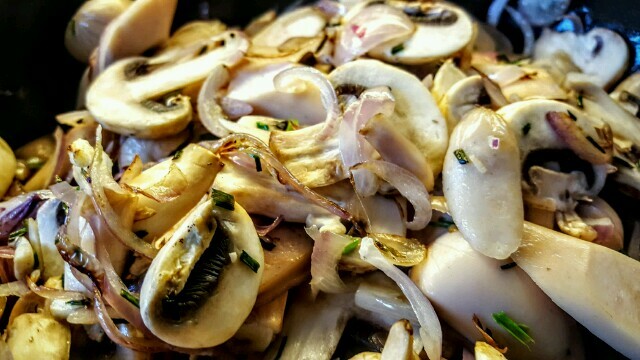 Once the onions gain colour, add the mushrooms and stir fry them till they are well browned but not limp. 3. Add the sausages and cook till done. Most processed sausages take about 10 minutes. 4. In a bowl, mix the cornflour with 2 tablespoons of water and set aside. 6. Adjust seasoning, you could use oregano instead of parsley if you wish. 1. Wash and cut the veggies as needed. 2. In a serving dish start plating up. 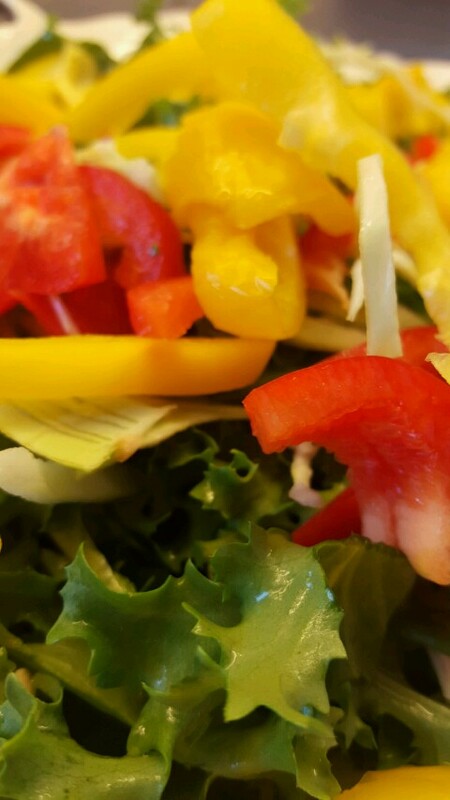 Place the green at the bottom, add the bell peppers on top. 3. Add the sliced radish and carrots. 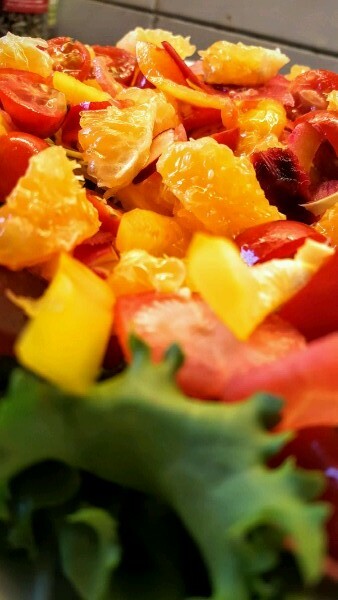 And top with the cherry tomato and clementines. 4. Let it cool. Meanwhile add all the vinaigrette ingredients to an empty bottle and shake it well. The ingredients should we well blended. I’ve not used any oil in the salad, but if you wish, you could add olive oil. Or cold pressed coconut oil and add thinly sliced fresh coconut as a dressing. In that case use pineapple instead of strawberries.